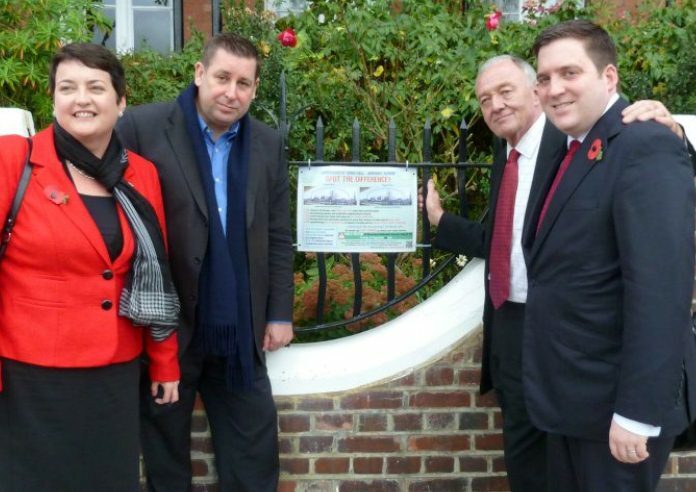 Val Shawcross, Stephen Cowan (Leader of the Opposition, London Borough of Hammersmith and Fulham), Ken Livingstone and Todd Foreman (Labour GLA Candidate for West Central) visit Hammersmith riverfront, where the the Tory Council is planning a luxury housing development (but no affordable housing) as part of a wider effort to change the demographics of the Borough. As Labour’s candidate for West Central, I am standing in an area which is undergoing a radical experiment that is turning swathes of London into no-go zones for ordinary working people. West Central is made up of Kensington and Chelsea, Westminster and Hammersmith and Fulham, which have the 1st, 2nd and 5th highest mean average private rents, respectively, in England. Affordable housing is in desperately short supply, and housing tops the concerns of residents at my advice surgeries. This week the Conservatives announced their latest housing policy; this will do nothing to help the worsening crisis in West Central. Thousands of residents have recently received letters telling them that due to new caps, their housing benefit will be cut drastically. For some this will mean a rapid spiral into debt; for most, this will mean that they will be forced to leave their homes and move to distant areas where they can find rental properties within the new benefit caps. Children will be uprooted from schools; workers will face impossible and expensive commutes to jobs; and families will be forced to move far away from friends, loved ones and communities. In short, we are about to see a massive social experiment that is part of a deliberate strategy by the Tories to turn West Central into an area that is only affordable for the wealthy. And it’s not as if the local Tory councils are helping matters, either. Take Hammersmith and Fulham, which suffers under one of the most vicious Councils in the country, and where the Tories are in a race against time to change the character of the Borough before Council elections in 2014. Their strategy is Dame Shirley Porter 2.0. Housing owned by the Council is being sold off and legal loopholes are found to maximise profits at the expense of providing affordable homes. Stable communities such as the Hammersmith’s Queen Caroline Estate are labelled “not decent” by the Council and slated for demolition to make way for unaffordable private housing, without a guarantee to local residents that after ‘temporary’ decanting they will ever be able to return to the area. Tory policies are increasing homelessness; in Kensington and Chelsea, statutory homelessness is up an eye-watering 41% from 2009-10 to 2010-11. The consequences for West Central are terrible. Young people have little hope of staying in the area as they reach adulthood, and the socio-economic diversity is being squeezed from our communities. The free market will never provide a solution to West Central’s lack of affordable housing, especially when government is actively making matters worse. We need a Labour GLA and Mayor who will prioritise affordable housing and use their planning powers to promote truly affordable housing developments and restore the affordable housing targets which Boris Johnson scrapped. And London’s regional government must lobby central government to encourage Councils to build more affordable housing for social rent. The scale of the challenge is immense, and it is critical that we elect a Labour Mayor and Labour GLA in 2012 so that we can begin to tackle London’s housing crisis. Todd Foreman is Labour’s GLA Candidate for West Central and Councillor for Notting Barns ward in the Royal Borough of Kensington and Chelsea. HSBC agreed to keep cash machines on Portobello if site can be found . At a meeting at Kensington Town Hall on 1st November, HSBC bosses have agreed that whilst they still intend to close the 152 Portobello Road Branch on 16th December, they will work with Labour Councillors, led by Cllr Dez O’Neill of Colville Ward, to find an alternative location for the ATM cash machines on Portobello Road that we said are so important for the local economy. Cllr Dez O’Neill, Colville Ward, Cllr Emma Dent Coad, Deputy Leader of the Labour Opposition Group, and Labour Group Chair, Cllr Pat Mason, told HSBC bosses that it was wrong not to have consulted with Portobello and Golborne Road shops and market traders before deciding to shut the local bank. Councillors were enraged to learn that HSBC had been planning the closure for a year, but had failed to contact local Councillors. “My committee represents shops, stallholders and residents, and the closure of this branch will be a devastating blow to the financial well-being of Portobello Road, Golborne Road and the surrounding area”. (The full statement will be forwarded). Councillor Dez O’Neill said, “The cash machines are very important for visitors to Portobello, for traders and local people, and for the local economy, and I am going to work with HSBC to find a suitable location to keep them on the market”.